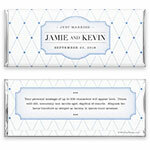 A classic, simple argyle print adorns this unique wrapper design. Design: Diamond pattern stitching and an elegant text frame. Personalization: Front message, names and date with back message.